Volkswagen has a very long history of building vans. One of its most famous van models was the 1950 "hippie van.” After that, Volkswagen vans were simply too funky for a mainstream audience to pick up. It is safe to say that Volkswagen has never had a modern competitive minivan. In an attempt to salvage this situation, they introduced the VW Routan. The Routan is actually a reworked version of Chrysler's minivan. The general shape of the Routan is not that different from the Chrysler's design; however, its redesigned rear and front highlights the slight make over. In 2012, the production of the Routan was discontinued after a brief four year run. There are a fair amount of options to choose from if you decide to purchase a used Volkswagen Routan. Some of the other vans in Volkswagen's line up include the Eurovan and Vanagon. 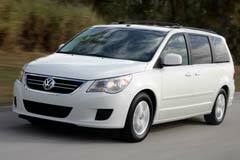 2009 Routan S Calla Lily White Volkswagen Routan with 82897 Miles available now!